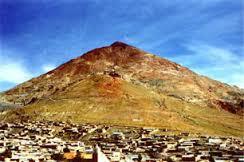 At the foot of the mountain called Cerro de Potosí (commonly called the Cerro Rico or rich mountain) is the Bolivian city of Potosí itself. The mountain has been mined for silver since the Spanish conquest in the 16th Century, Cerro Rico contained the world’s largest silver deposits and to date over 60,000 tonnes of silver have been mined from the mountain, with still more unmined silver remaining. Without the silver mines of Cerro Rico, the city of Potosí would not exist and in its heyday it was one of the largest cities in the world. The profits from mining though initially came from the exploitation of slave labour, first from the indigenous population and later from African slaves. But whether those who worked in the mines were slaves or ‘free’ workers the work was always dangerous. It has been estimated that from the 16th Century through to the present day about eight million miners from the Cerro Rico went to their graves prematurely – it is hardly surprising that it has been described as the mountain that eats men. The film is a German produced documentary that focuses on the working lives of a group of miners in a mining workers’ cooperative, one of many who work in the Cerro Rico. For many of the miners they are doing the same job as their fathers and grandfathers, they know of no other life. Given that the mountain has been so extensively mined the miners have to travel over a mile into the mountain just to get to the silver ore. The film follows the miners through a standard working day as they enter the mountain and the talking in the film is left by and large to the miners themselves. The work remains dangerous with miners having an average life expectancy of only 40, it is often a question of what kills them first – a mining accident or premature death from continual breathing of toxic dust and fumes. Though part of a cooperative the miners receive a relative pittance for the ore they extract and the real profits are made elsewhere by multinational companies. Though relatively short at just 30 minutes long that is all it takes for the film to demonstrate the sheer brutality of the work performed by the miners. It is recommended watching as it shows the mining industry at its very worst. Not just in terms of the negative environmental impact but also the negative impact on those forced to work in the mine because it is literally the only way they can earn a living. Please click on the link to find LMN's Final 2017 accounts.